The view from my desk has changed quite often in the last year. Going into 2015, I’d converted to a makeshift standing desk, only to discover over the next six months that 1) standing for long periods of time while trying to write fiction made for very ouchy feet, and 2) I was more likely to disconnect my laptop and go sit on the couch whenever I needed to spend any extensive time on the computer. When I was offered a free desktop convertible desk right before we moved, I definitely took it. Writing has been difficult for me for the last few years. A big chunk of that has been because of the troubles and struggles during that time. Part of it, though, got a lot worse after we sold our house and moved across the country to Massachusetts. I never did find a comfortable desk setup – sitting or standing – and so I became distracted easily whenever I tried to write. 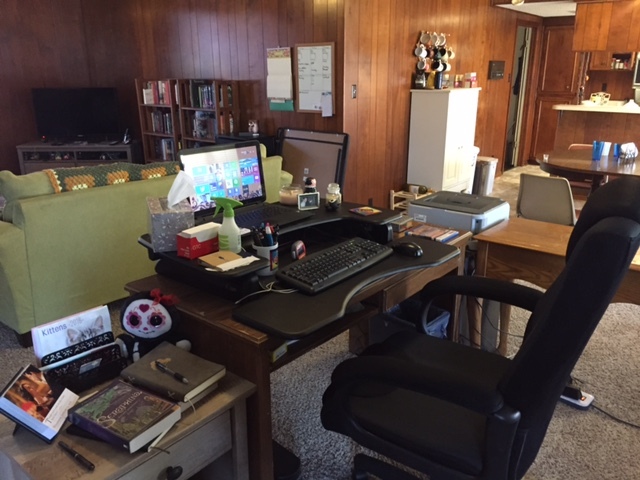 When we first moved back to Texas this summer, I loved settling into the new house, and I loved my new office setup. Only it wasn’t long before we had to rearrange the room, and relocate my office area. And I found that I still had a lot of trouble writing, particularly with getting distracted. About a week ago, I took a look at my office space. I was situated into a place with a lot of room behind me. The boys deal with all their backpacks in that space, or got onto the elliptical (also behind me). I had the unused fireplace to my right, the boys’ desk to my left, and the dining room and kitchen in front of me. I found myself turning to look out over the living room often, especially out the large front window. The dining room and kitchen are places of chaos and stress for me (long story), and I prefer to look out windows instead of at places of chaos and stress. The whole setup felt wrong somehow, and I decided that now was a good time to change. Change doesn’t have to be big. This one pretty much involved swapping my desk with the boys’ desk. (Pic is terrible, but gives the right idea.) Now, their desk and the kitchen/dining are to my right, my elliptical and the backpacks are to my left, the fireplace is behind me, and I look out over the living room toward the big front window. I can see all my books from this vantage point, all the crocheted throws covering the couch and chairs, and all the parts of the room I love. My back is protected, so that it doesn’t feel like someone can come up behind me suddenly (this is a PTSD thing). Will this mean that I can write again? I don’t know. I still have troubles and struggles, and I’m well out of the habit of regular writing. But I think changing the shape of my office area and the layout of my space can really help me to feel calmer and less distracted. Even if it doesn’t turn out to help with the writing, I certainly enjoy the view from my desk a whole lot more now! I just did the same thing a few weeks ago. 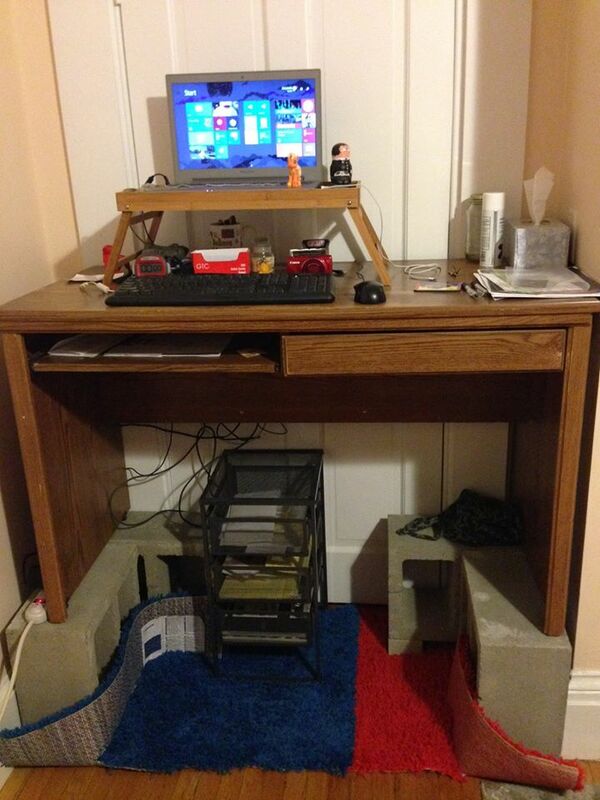 I had been using a small computer cart instead of a desk. There was no space for anything but the laptop and a coffee mug… and I wondered why I felt so constricted and unorganized! Switching to a desk and organizing all the books and notebooks and things I need into logical piles has made a difference, emotionally and practically. Oh man. I imagine that felt totally claustrophobic! I’m glad you were able to make such a difference. It’s too early still for me to tell what kind of change this made, personally, but I know the room flows better now in general. For everyone. Nothing yet, but there have been other crazinesses happening at home, so it’s not like I’ve had time to try it out yet, heh! I hope this works for you, Amanda! I agree that the setting in which we work is so important and sadly so often neglected. Since I spend a majority of my day at work, I have been very diligent in making sure my office is an environment that is soothing and yet inspiring. My colleagues call it the zen office, so I suspect I achieved my goal. It makes a huge difference in my mental state of mind for the day when I walk in and see my pictures and my toys, my clean desk with a layout that works best for me, etc. Those days where I have to work at the other building and borrow a temporary office are decidedly more stressful. I like the idea of a zen office! When I first moved into my new place, I was so excited to have space for a proper little office corner.. then I realized, I was never using it and always resorting to my lap-desk/bed office. I ended up moving the desk back into my bedroom, but my favorite “desk” has become the little $7 ikea side table that I have in the living room. It’s so light and just the right size to move around the house. I can write on the couch or floor whenever I need a change from the real desk. I think if I had a different laptop, I’d probably just carry it around with my lap-desk and a wireless mouse! I’m really thinking about switching soon, tbh. I’m tired of my PC and want to switch back to Mac…if I can ever afford it!